Two and a half years of waiting and yesterday we were able to see a serious answer to our prayers. Our adoption was finalized. Even as I type this, tears are streaming down my face, because this has been an unimaginable journey full of every single emotion you can fathom experiencing. I am humbled. I am blown away. I am elated and I am sorrowful in parts as well. Adoption is a beautiful thing but we've had our struggles because some people do try to make it an ugly thing. Today though we get to say that God has taken a situation that looked broken, and healed it. He brought a dimpled little boy into our lives who we love fiercely - and who loves us fiercely back. We've bonded and blended as a family. Every day we learn something new about each other and we're all growing and learning. This is a good thing - a God thing - that I really must declare. He is good. He is faithful. He is merciful. He is loving. He is compassionate. He is faithful. He is a strong tower in the midst of the most violent storms. He comforts His people in their distress. He binds the broken hearts. He is faithful. He is good. You know how they say it's easy to say, "He is good" when things are going right? That's not always the case. It's very hard to publish this. But I feel that I simply must because He is SO GOOD that He lets me trust Him even in telling you all that we are officially the parents of two amazing sons. We are singing and there is a melody in our hearts, not easily heard or easily won by any means. But He is faithful. There is a particular adoption book I wanted to highlight today which, when I saw it at the Book Expo a month or so ago, it reduced me to tears. There I was, standing next to the Barefoot Books representative, and I was wiling the tears not to fall. 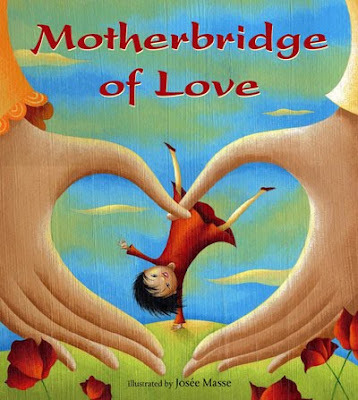 Motherbridge of Love tells the story from the perspective of a mother who has adopted a little girl from China but the sentiments are ones I share today. "Once there were two women who never knew each other . . ."
"The first one gave you life; the second taught you to live it . . . "
"The first gave you a need for love; the second was there to give it . . ."
The story is based on a poem that was written by an anonymous adoptive mother. It explains to the child that they are part of two worlds, really, but both come together to make them who they are. It is a story of affirming love. I appreciate Barefoot Books giving me the opportunity to read through it. Adoption is a precious and delicate thing and we've discovered it involves a whole lot of people. We're grateful for the journey, grateful for the opportunity to have a little Bookworm2 who has the most amazing smile, is developing a cheeky little sense of humor, who adores dogs, and mimics everything his older brother does. He is a joy and a delight and we are cognizant of the responsibility involved in raising him. We pray for him daily - that he would grow up believing in the blessing of adoption and, more importantly, will know the God who made him. To our son - we love you more than words could ever possibly say. You are a treasure (I do not say that lightly) and we thank God for you! P.S. I know there's kind of been a deluge of posts these past couple of weeks (but did you SEE my nightstand!??!) I promise this will even out a bit in the next week or so. I'm going to offer an (extremely tiny) apology for one more post that is coming up today with a nice giveaway attached, sharing some of the books that our littlest guy has really been enjoying lately, in celebration of him and to share a little bit of our joy with a few of you. I am rejoicing with you! Praise God!!! How wonderful! As a mother of 2 adopted children, I can really relate to this post. I need to look for that book! CONGRATS! Serious congratulations, Carrie. So much to be joyful about!! Congratulations and praise God for a wonderful outcome to a difficult situation! Hallelujah! What a wonderful answer to prayer after a long journey! Congratulations! My own daughter is adopted -- and I completely forget that particular fact all the time, as does she. The bond is intense and God is so good! I'm so glad it all worked out for you -- enjoy, enjoy, enjoy!!! Your adoption was finalized???? Whoohoo! Congratuliations. God is GOOD! What wonderful news!!! That is super exciting what a tremendous blessing! Praise God for His abundant blessings...celebrating with ya'll all the way from Texas! I think that this is truly a moment you cannot keep to yourself. Joy is abounding in your hearts. God bless you always! we're so pleased and thankful with you guys! Yahoo! INCREDIBLY exciting news! :) What a blessing. As an adoptive mom of 2 (soon to be 3 when our daughter comes home from Congo this fall! ), I want to offer congratulations! Adoption is certainly an opportunity to see God powerfully and I'm so glad you've had that blessing! May you have a wonderful summer as a family of 4! Congratulations! Thanks for sharing your happiness! I am so, so happy for your family! I know this is something you have wanted to so long! It's amazing to see God grant this dream to you and your boys. We serve a mighty God. Love from Pittsburgh! GOD IS SO GOOD! I have goosebumps! Through the fire. YES! Congratulations! God bless you and your family. Thank you for sharing - I am so happy for you! Praising God for sculpting your wonderful family! YAHOOO!!!!!!!!! Praise God!!1! So EXCITED and HAPPY FOR YOU!!!!!!!!!!!! Sooooooo happy to hear that your adoption was finalized. *hugs* Praise the Lord! Congratulations! God is so Good! Your story made me weep with Joy for all of you. You all are awesome! Thanks so much for rejoicing with us!! As one who has also experienced the road of adoption, my heartfelt congratulations to your family! :) yay! so happy for you! God certainly is good and He deserves all the CAPS !! I don't suppose there is a copy of that poem anywhere? My sister placed a baby for adoption some 23 or 24 years ago -- they are happily a part of each other's lives now. Congrats to you! This is such a thrilling moment, and I am very happy for you and your family!! SCC's song God is God is such a great song!! Congrats! I know that he's been yours in every way that really matters for a while now, but it's always nice to be "official." So glad that you chose to follow the example of our Heavenly Father! Oh, that is so awesome. Congratulations on this fantastic news! Rejoicing with you!